In 1920 �Artillery Training Volume 2 � Gunnery (Provisional)� appeared. It replaced Field Artillery Training 1914 and various Notes published during the war. It incorporated the methods and practices that had evolved during the war. It explained the content of RTs, addressed calibration and affirmed a preference for the fall of shot method. Although it stated somewhat optimistically that it should be possible to adjust the muzzle velocities (MV) by shooting through screens, and stressed the need to sort propellant. It also provided details about registration procedures and target records, datum and witness points, sweep and search, and crest clearance. It also stated that for ranging the short bracket was 100 yards and that longer brackets should be 200, 400 and 800 yards. Mapping and survey matters were explained, including that the army may have to fight in unmapped country. The artillery board was explained, including instructions for its construction by sticking linen and gridded paper to the board then cut up map pieces and paper arcs. Mapping and survey is explained here. It also listed the sources of variations that affected line, range and corrector (for airburst fuze setting) and highlighted those that changed rapidly and were �normally taken into account�. These are explained here. One of the legacies of WW1 was various types of ammunition for each type of gun and at the end war shells with a more streamlined shape had started to appear. In 1920 Major HC Harrison writing in the RA Journal made a 'plaintive demand for one projectile, one driving band and one propellant'. The variety meant additional Range Tables, and data was evolving. However, the British method was to calculate a corrected range (distance to target), which, after altering for its position correction, the gun set on its range indicator (range drum). The range indicator converted the distance into a Tangent Elevation (TE) angle, but the relationship between range and TE was that given in a particular Range Table. Obviously if a different Range Table was being used then the Range & TE relationship could be invalid, particularly if the ballistic coefficient was different. The solution to this was, as in WW1, a tabulated false range. There were, of course, consequences from the formation of the Royal Air Force. In 1919 responsibility for preparing artillery meteorological reports was transferred from the Royal Engineers (RE) to the Met Office of the new Air Ministry. The Met Office was staffed entirely by civilians. In UK and some overseas stations it meant that in peacetime meteorological reports were produced by the civilian meteorologists at RAF Air Stations and a few Met Office stations at army establishments including some Schools of Artillery. In 1921 the War Office and the Air Ministry agreed the provision of meteorologists for a small Expeditionary Force, using Met Office volunteers, the numbers were never achieved. However, the Air Ministry published a manual in 1929, MO 317 �The Supply of Meteor Reports to Artillery Units�. Meteor is explained here. In 1921 artillery took over responsibility for sound ranging, flash spotting and artillery surveying to provide fixation and orientation to artillery units. In WW1 to these had been an RE responsibility in what eventually became the Survey Battalion in each army, although they had contained many officers and soldiers from Royal Horse Artillery (RHA), Royal Field Artillery (RFA) and Royal Garrison Artillery (RGA). This new branch of artillery was initially headed by a former RE officer. However, until the 1930s the term 'survey' was also used for the processes for determining the range and line between guns and targets and this was undertaken by the firing batteries. In 1924 they produced the �Manual of Artillery Survey Part 1�, this complemented the standard army �Manual of Map Reading and Field Sketching�. It discussed the pros and cons of measurement and calculation as methods of producing map data, suggested that while 5 figure logarithms were most suitable 4 figure were probably adequate. It also discussed the merits of plotting on maps and artillery boards, preferring the latter. It referred to the artillery board as the physical item that was set-up as the 'fighting map'. 'Part 2' of the manual comprised 5 figure logarithm tables. It describes an artillery board and its accessories, this was probably 'Artillery Board No 1' and appears to have been 18 � 24 inches, probably a successor to the WW1 RFA segment pattern board. It was plywood board mounted on a plane table tripod and included a brass pivot with associated rulers, a graduated metal arc and various scales and templates for marking a grid and plotting coordinates. However, it also emphasised that use of the board should be exceptional and its purpose was to provide a check on computation and "not merely save time and labout". It also mentioned the �brigade (ie regiment) survey officer�. It dealt comprehensively with survey methods (traverse, triangulation, field astronomy), Bearing Pickets and arbitrary grids. New editions of the �Manual of Artillery Survey� appeared in 1927 and 1932, the latter lasting until after WW2. The 1927 edition was similar to 1924 but with less detail although it stated that an artillery board was a plane table with accessories to make it suitable as a map board. A 1932 amendment to the 1927 edition referred to a new Mk 3 artillery board using the board from a RE plane table adapted to fit a parallescope stand and 1:25,000 scale accessories. The 1932 edition was similar in scope to its 1924 predecessor but written in a more accessible style. It made no mention of artillery board construction but dealt with measurement methods in more detail. In 1936 new mapping policy was issued by the War Office. It established the scales for military maps, including 1:25,000 large scale maps for artillery use. Mapping and survey are described in more detail here. At this time the options for orienting the guns were generally similar to those from before WW1. However, the order of preference for the methods had changed significantly with the need to have fix and orientation aligned to the map as quickly as possible to enable map shooting There was also great emphasis on accurately establishing the Zero Line (ZL) between the pivot gun and the Zero Point (ZP). Ideally the ZP would be surveyed and the ZL calculated. The importance of this was that the observer could see the ZP and would order switches from the ZL to the targets he wanted to engage. Battery deployment started with the Battery Commander (BC) selecting the battery ZL of the pivot gun. This line could be directed at an actual target, a ZP or be any suitable bearing for the battery�s tasks and could be changed at any time. It was the Gun Position Officer's (GPO) task to align the pivot gun with the zero line and the other guns parallel to it. The guns were deployed in a straight line about 20 yards apart whenever possible. Aligning the guns could be by either an individual angle from the director or by battery aiming point (AP). The former was always used at night but by day was slower than a battery AP, a clear feature in the landscape selected by the GPO and visible to all guns, which remained the preferred method. Each gun also selected its own Gun Aiming Points (GAP - (previously called an auxiliary AP) and recorded their angle to two of them after aligning in the ZL. A battery picket at least 300 yards away from nearest gun, preferably to the rear was also set up as the GAP for night laying. Aiming posts and paralleloscopes were also issued to guns as an alternative to a distant GAP. Guns were modified to have a small plate fixed near the sight on which the angels to the various APs were written, interestingly it only included GAP1, GAP2, Picket and Paralleloscope. When there was no suitable AP for the guns then the director was used, being placed at least 100 yards from the nearest gun as an extension of the gun line. It was aligned by pointing it at a target, the ZP, or aiming posts in line with target or ZP. Alternatively a compass bearing to a target or ZP from somewhere it was visible and in line with the director, or measured from the map, could be used. When using a compass bearing or map bearing the director was aligned using its own compass. AT Vol 2 recommended that the ZL was �shot in� as soon as possible to identify it on the ground if a ZP was not used. how the data was obtained (shooting, map reading, survey). Underlying these standard deployment procedures was the assumption that survey would happen later. In AT Vol 2 �survey� was addressed in the Predicted Fire chapter, and there was no suggestion that it was part of routine battery deployment. This was despite the existence of a survey officer and section in each artillery brigade (ie regiment) and the creation of official forms for some basic survey tasks. Position corrections, to correct for irregular gun layout and or large switch from ZL were also calculated and tabulated by the GPO for use as needed. Concentration corrections to converge the guns onto a point were calculated by sub-tension if the layout was regular. If the layout was irregular then a concentration table was prepared. One officer was appointed the Gun Position Officer (GPO) and responsible for technical matters at the battery position. He established a Command Post (CP) and was assisted by the GPO Assistant and GPO's Computer. Broadly, the GPOA was responsible for using the artillery board while the GPOC handled corrections for non-standard conditions. Once mechanisation started the battery CP could be in a covered vehicle. The artillery board increasingly became the usual method of finding the range and line to the target, although since the observer usually ordered a switch and range it was generally only required for map shooting. However, calculations were always used for datum shoots. In 1923 a new Confidential gunnery publication appeared, Range Tables Part 2. It took the �instructional� information that had started appearing as appendices to Range Tables in 1918 and greatly expanded it. It provided worksheets for calculations (and included non-rigidity in calibration), slide rule settings and a comprehensive set of mathematical tables (log, sin, etc). It also provided tables for angle of sight (with heights in metres). Range Tables (now Part 1) continued to evolve, mainly in the way data was arranged, presented and labelled. The versions issued at the end of the war had changed terminology to providing �corrections to range for variations (in conditions)� instead of just detailing the variations and implying corrections in the body of the main tables. By this time the main table had expanded to 20 columns or more. However, there were also tables that gave �variations in range for corrections to (conditions)�. These were used to determine the coordinates of a target from firing data after ranging the target. In the late 1920's tabulated non-rigidity data was added. It also included crest clearance tables and data explicitly for calibration. Calibration is described in detail here. Crest clearance was identified as the main problem in selecting a battery position. The GPO was responsible for clearing crests that were visible from the battery position. Crests further along the trajectory were a matter for the BC. The minimum elevation to avoid a crest included allowance for trees, etc, less 100% diszone (ie a decreased range to crest, means a larger Quadrant Elevation (QE) to be safe). Charge temperature was handled as if it was an external ballistic variation. The �purist� ballistics approach would have treated it as an internal one. This would have involved converting the temperature variation into a muzzle velocity (MV) variation then calculating a range correction. Instead data was provided to convert the temperature variation directly into a range correction. Revised editions of RT Part 2 appeared in 1928 they were no longer Confidential. The differences included concentrations, distributions and position corrections in both tables and graphs, and angle of sight tables were provided for heights in feet and yards as well as metres. There were slight changes to various calculations including for map range. Additional calculation templates were given, including for clearing an intermediate crest. Another revised edition appeared in 1930 but the changes were mainly in providing clearer explanations. An amendment in 1931 provided revised calculations for calibration. Further editions of �Artillery Training Volume 2 � Gunnery� (AT Vol 2) appeared in 1928, 1932 and 1934, and the latter was the baseline for WW2. The first two followed the lines of the provisional 1920 edition. The various sample worksheets evolved, non-rigidity was introduced for corrector (ie fuze length) calculations in 1928 and for range when map shooting in 1932. It also used a �fighting map� at 1:20,000 or 1:40,000 scale (until 1:25,000 was adopted in the mid-1930s), mounted on the artillery board. The 1934 edition of AT Vol 2 represented a step forward and there were other changes in the following years. However, it continued the underlying approach of two types of shooting: ranging, when the gun was the rangefinder and processes were kept simple and fast, and map shooting (now renamed �predicted fire�) when full calculations were done. Of course calibration had to be maintained and ammunition always sorted. The latter was more complicated, shells were sorted in four steps and cartridges in two. For shells it was by type (eg HE, smoke), shape (ie crh), driving band (there were different patterns) and by weight (shells were weight coded). Much of this probably reflected residual WW1 ammunition stocks as well as more recent designs. Cartridges were sorted by propellant type and then lot or ballistic group numbers. B 250 Bearing Picket Card. B 2547 Bearing Picket Procedure (to record angles and calculate angles and distance to battery director and pivot gun). B 2548 To compute line, Range and Angle of Sight from known Co-ordinates of Gun and Target. B 2551 Correction of the Moment (to calculate corrections from the met message and local variations such as charge temperature for the zero line and lines 20� left and right at 3 ranges, for plotting on a graph). W 3981 Gun Programme (firing data for a gun in a programme shoot). At this time the normal method of observed fire meant that the observer ordered targets to his battery by giving the switch from the ZL and the gun range. This was the system that had been used before and during WW1. It was a very fast method of shooting, particularly when combined with the new calibrating sights on the guns. However, it did need skill for an observer to visualise the line of fire on the ground, hence the importance of the ZP, particularly in badly mapped areas. The GPO selected the charge and if necessary ordered position corrections. 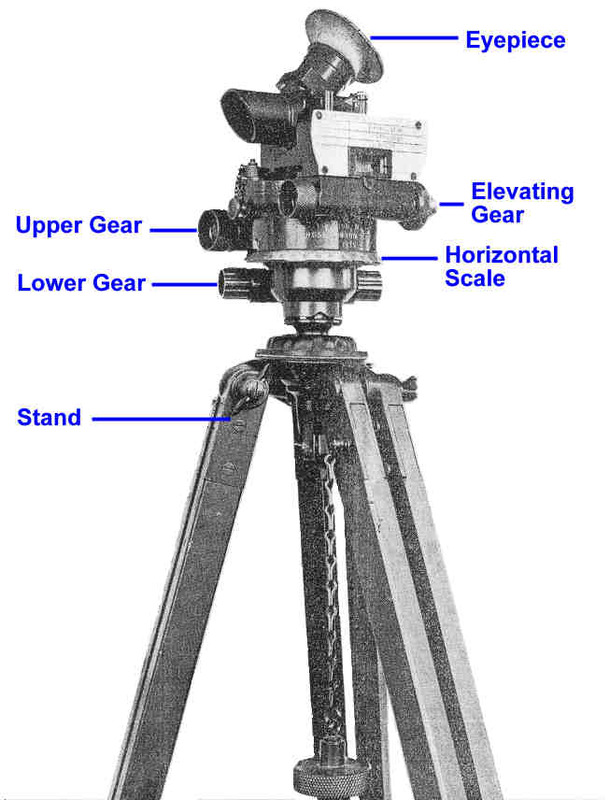 Of course the observer had the option of ordering an angle of sight if he considered it significant and could order �correction of the moment�, which meant the Battery Command Post (CP) had to calculate and apply the corrections for non-standard conditions (apart from MV, which was always applied through the calibrating sights). Ranging proceeded with the observer ordering a switch from the current line and a new range. For a single battery, if both target and director were visible from the observer then the �TOB method� (target � observer � battery) could be used to produce a gun-target range and switch from the ZL. 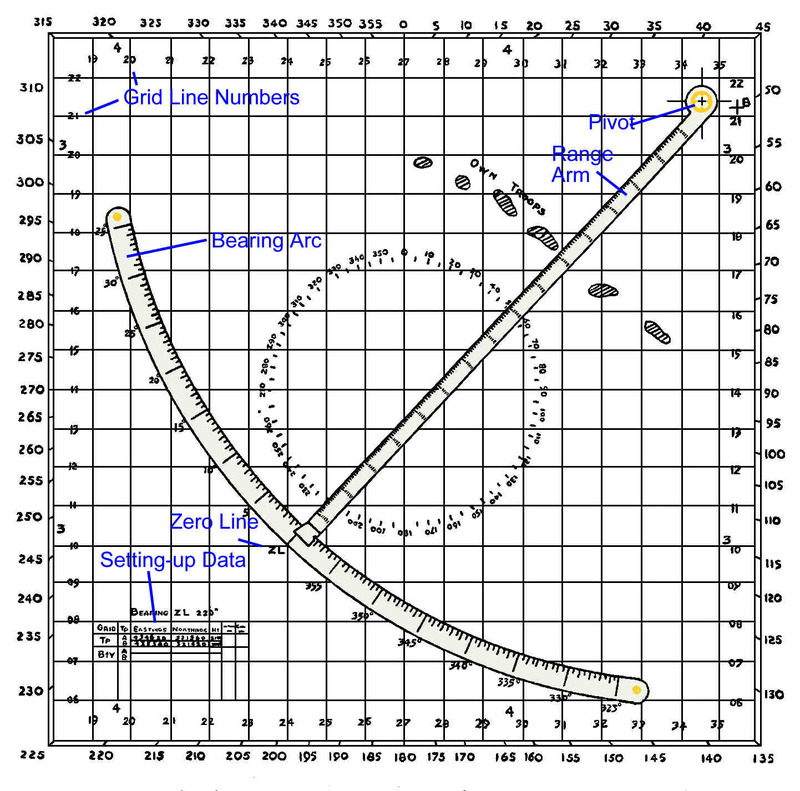 The angle TOB was measured by the observer, who also calculated or estimated the distances OT and OB, and then used the pre-WW1 field plotter to find the range and switch from the ZL. BCs could be ordered to individually engage the same target, although several batteries ranging a target at the same time was potentially confusing. Each battery could range the target in turn. The target could be engaged with �brigade fire�, each battery firing a round of gunfire with an interval between batteries then individual corrections ordered to batteries. Range the target with one gun from one battery, which determined the corrected or uncorrected coordinates of the target and circulate these to the other batteries. Use predicted fire when target coordinates were known. When a target had been ranged it could be registered and the switch and range converted to coordinates. �Uncorrected� meant that the �as fired� switch and range were converted to coordinates, so they included allowance for non-standard conditions. This was acceptable if the target was to be fired at within an hour or so. �Corrected� meant that corrections for non-standard conditions had been removed, so the coordinates were as close as possible to �truth� (providing the firing battery was surveyed to the map grid). However, neither AT Vol 2 nor RT Pt 2 gave any instruction on a method for this, particularly the tricky bit of adjusting the coordinates to find the target location and height that �fitted� the QE split into the angle of sight and TE. Of course there was only one way to do this � �trial and error� to find the location of a point with height that fitted with range. Between 1936 and 1939 there were six amendments to the 1934 edition of �Artillery Training Volume 2 � Gunnery�, numbers 2 (7/36) and 3 (3/37) are noteworthy. No 2 provided a new appendix that changed the calibration methods and No 3 added a new appendix on target records. The former highlighted the importance of calibration not just for predicted shooting but also for �brigade control� (ie multi-battery) to ensure that batteries shot together. AT Vol III Organization & Deployment was issued in 1921 (Provisional) and 1928 it addressed tactical and artillery staff duties matters including counter-battery fire. Amendment 2 in 1932 added a new chapter dealing with artillery deployment and related orders including map marking symbols. Practices that had evolved from WW1 were regularised by introducing another Army Form (B 2569) Target Record Form. Targets could be registered by firing or silently (ie by map inspection or survey). The form was used by both OP and battery CP, and recorded line, angle of sight and range from both. It also allowed for changes in data as survey information improved or the target was registered. The back of the form was used for calculations and recording other information about the target. It was supplemented by amendment 5 (6/38) that introduced a system for numbering targets. In essence brigade targets were numbered from 1 with the prefix �M�. Within a brigade batteries used the prefixes P � S according to battery seniority. At corps and divisional HQs target numbers used the 4 digit grid square number and a letter suffix, with some letters reserved for hostile batteries. Why the letters P � S were selected for batteries is unclear, but one possibility is that these letters substitute for B in the angle OBT (observer � battery - target). Barrage procedures in a battery CP were also fully formalised, they were based on orders issued as a trace drawing. The overall barrage comprised lines (or �lifts�) stretching back from the opening line, normally 100 yards apart in the barrage �lane�. The lines were parallel unless the barrage had a turn in it to change direction. In a simple barrage the opening and final lines and the outermost lane edges gave a rectangle, and the coordinates of its corners were stated. Barrages were planned at division or corps and the traces issued downwards. At each level the lanes for the immediately subordinate units were defined. For example a regimental adjutant allocated battery lanes, when there were three or more batteries in a regiment one battery was superimposed across the regimental lane. When the battery received the barrage plan and its lane firing data was produce. For a barrage this was always provided in writing to each gun. In 1936 a new series of publications appeared, �Directions for the Use of Artillery Instruments� (DUAI). No 2 was for the artillery board. 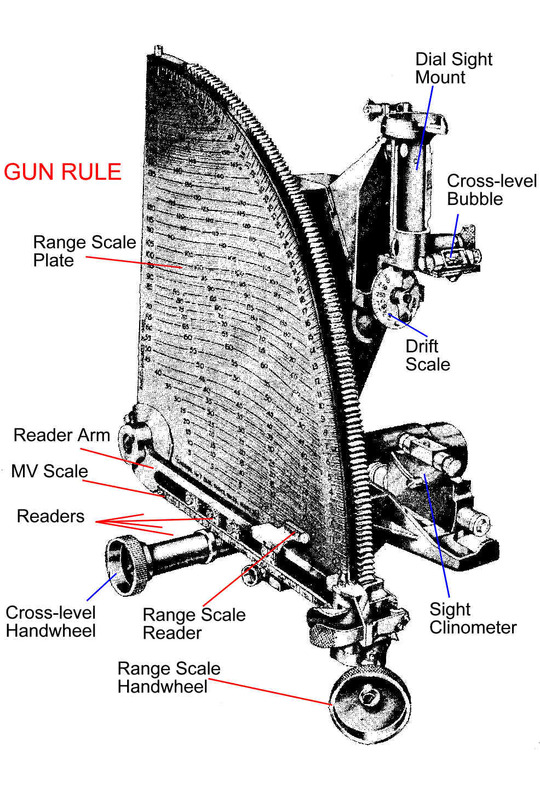 DUAI No 3 was for the 10-inch Slide Rule RA and its use for the trigonometrical calculations associated with angles and distances used in gunnery. DUAI No 4 was for the No 7 Director, which could measure both horizontal and vertical angles. The No 6 Director, which had replaced the WW1 No 4 director and could only measure horizontal angles, remained in service. DUAI No 2 provided comprehensive instructions for using the artillery board. It stated that �the artillery board, when mounted with gridded paper, can be used for the graphic solution of any problem involving map references, co-ordinates, bearings, switches, ranges, etc�. It listed its primary purposes as �to find the switches and ranges to targets whose map references or co-ordinates are known; to deduce map references or co-ordinates of targets to which the switch and range have been recorded; and to plot the observations taken at an Observation Post (OP) in the course of silent registration�. Reference to the 'fighting map' had disappeared. Artillery boards were made of wood in two sizes: No 2 was 21� � 21� � 1� inches and No 3 that was 30� � 30�� 1� inches. Each had associated �cover� (AF B 2559 and 2560) of the right size, which was used instead of a �fighting map�. These were of linen backed paper gridded with 1,000 yard squares at 1:25,000 scale and big enough to wrap over the edge and be pinned to the board�s underside. Degrees were marked around the edge of the cover to help with selecting the position of the range arm pivot representing the pivot gun. The main accessories were stainless steel pivoted range arms marked to 12,000 yards for the No 2 board and 16,000 for the No 3, and steel bearing arcs covering 60� for the No 2 board and 70� for No 3. The brass pivot was some � inch diameter with a central hole with internal marks to enable it to be centred over a coordinate plot. Other accessories included romers graduated in yards and metres, Protractor Plotting No 1 and measuring scales also in yards and metres, gridded tracing paper (AF B 2561 and 2562), a canvas case for the board and a tripod � Stands Instrument No 27 � on which the board could be mounted. the switch angle from the zero line was read from the arc. The other significant instruments introduced in the 1930's were Probert pattern calibrating sights for the guns. This meant the standard range indicators were replaced by a gun rule integrated with the sights. Instead of each gun having to apply its own range correction for its variation in MV from standard, the correction was built into the range indicator and could be adjusted as MV changed. The MV setting was by aligning the range reader as an offset to the standard MV. This led to the introduction of new 'dial sight carriers' for each type of gun. The exception being 18-pdr, which having two man laying had a separate range indicator on the righthand side of the breech and the 25-pdr Mk 1 on the 18-pdr arriage also followed this pattern. All other guns used the Probert pattern shown in Figure 4. This meant that all guns in a battery could be ordered, and set on their sights, the same range no matter how different their MVs were. The final gunnery matter before the start of WW2 arose from the organisational change in 1938. This renamed RHA, field and medium 'brigades' as 'regiments' and changed from batteries of 6 guns using one position to batteries of 8 or 12 guns organised as 2 or 3 troops each with its own position in a battery area. Typically, these troops would be a few hundred yards apart. This re-organisation also removed the brigade survey section from RHA and field brigades. The new procedures were detailed initially in Military Training Pamphlet (MTP) 10 - The Field Artillery Regiment and 17 - The Medium Regiment 1938 for drill and manoeuvre, and control of fire, of the regiments on the new organisation. Each field battery now had four CPs in their gun area, one per troop (run by the troop GPO) and one for the battery (run by the battery Command Post Officer (CPO)). The CPO was responsible for technical preparations and control of fire in battery and his technical staff were �surveyors�. He issued orders to troop GPOs on all matters of technical fire control for the battery as a whole. The GPOs commanded their troops� guns in action, assisted by the troop�s WO 3 and GPO assistant in his CP. The troop commanders were the observation officers and could order their troop to engage a target without going through the CPO. Of course heavy batteries remained unchanged with a single battery CP. However, doubling the number of CPs in a field regiment would have been a training challenge, although disbanding the regimental survey sections would have provided soldiers with many of the necessary skills. Fire control procedures in a battery depended on whether observed or predicted fire was being used. Observed fire meant that the target was ranged and an observer initiated and controlled the shoot, which could involve the entire battery. This meant that there had to be a quick and simple way of adapting the firing data of the troop that ranged the target to the other troops in the battery. It also meant that there had to be procedures for getting the troops of a battery quickly into survey sympathy when they occupied a new battery position. The change in the number and size of batteries, and the introduction of troops caused revision to several gunnery procedures. The most obvious were those for barrages. However, operating in troops of 4 guns instead of batteries of 6 also reduced the amount of work in any one CP for procedures such as position corrections and the distribution of fire. 1. Observers could fire when communications were established to their troop, troops could fire as a battery but corrections to individual troops might be needed. 2. Troops� actual ZLs were made parallel. 3. Troop pivot guns� fixation was harmonised, with their ZLs as close as possible to grid in use. However, without a regimental survey section to survey between the two batteries, effective regimental fire rested on the hope that the batteries were close to the map grid, or for the corps survey company to establish a Bearing Picket (BP) in each battery area. No doubt in some regiments the second in command ensured that survey was carried by one battery to the other, at least when they were not too far apart. Parallelism was the critical element to ensure that the troops fired together, so the method of using an AP was generally replaced by orienting the director in the ZL using its compass and taking the mean of several magnetic compass �swings�. The battery director was the lynchpin of the procedures to ensure that all the troop directors were parallel in the regimental ZL and that the fix of the troop pivot guns were in harmony. This involved the use of simple survey methods, limited to bearing and distances over one or two �legs�. Firing as a battery meant that any one troop (the �control� troop) ranged the target then that troop�s data was converted for use by the other troops (�link� troops) of the battery. This required a method and procedure to enable all the troops of a battery to engage a target that one of them had ranged. The methods used either a new DW Plotter, (DUAI No 5 1939) or �rapporteur� to convert the control troop�s line and range data to line and range for the link troops. There were two methods, A and B, for this. In essence the �rapporteur� was a trace showing troop positions, that was placed reversed on the artillery board so that troop positions appeared in the target area. This meant the artillery board pivot represented the target. By positioning the trace so that the control troop�s position was at its switch and range, the link troop�s switch and range could be read. Method A was preferred once Stage 3 of deployment was completed. In this the battery CP converted the control troop data into data for the link troops. In Method B the control troop�s data was passed to the link troops, where they converted it. This was used when speed was paramount, for example Gunfire against moving targets. MTPs 10 and 17 required that a regimental trace of troop pivot guns was prepared and copied to all CPs. This enabled regimental shooting, as did the DW Plotter. However, they provided no procedure for getting batteries into survey sympathy. The CPO and his CP were responsible for predicted fire by the battery as a whole, particularly for programmed shoots (ie fire plans). They calculated correction of the moment data, using AF B2551, from meteor telegrams received (hopefully) every 4 hours and charge temperatures reported by the troops. The output of these calculations was plotted on a simple graph, and distributed to troop CPs in case an observer ordered its use with observed fire. Of course predicted fire for a 12 gun battery was simplified by using calibrating sights and ordering range in yards, which removed the need to calculate an individual tangent elevation for each gun. The change in organisation (fewer but larger batteries and more CPs) meant changes to barrage procedures. A troop in each battery was superimposed across the battery lane instead of a battery across the regimental lane and the preparatory work was divided between battery and troop CPs. The first step was for the battery CP to annotate a trace for each troop but adding troop lanes and other information and distribute them to the troop CPs. Then the battery CP prepared a Barrage Key Lines Form (B2505-6) for each troop, these gave data for opening and final lines taken from the trace pinned to their artillery board. For each of these lines standard data (ie no correction for meteor, etc) for line and range was prepared for the pivot gun to each side of the troop lane and then data to intermediate points interpolated. If the battery CP had a copy of the troop concentration and position correction tables then the actual corrections for each guns 2 - 4 were added and their actual line and range calculated, together with the angle of sight for the lines. Meanwhile each troop CP pinned their trace to their artillery board and completed their Barrage Key Lines Form. A battery surveyor took the battery CP�s form to each troop CP, added concentration and position corrections and compared the data with the troop�s form. Then each troop CP started preparing a Gun Programme Form (W 3981) for each of its guns showing standard data for every line, using interpolation between opening and final line data. This form including ammunition details and the timings for each line, together with the switch from one line to the next, angle of sight, total rounds at each line and method of fire. At the last possible moment before firing predicted range and ZL switch were added before issuing the Programme to each gun.